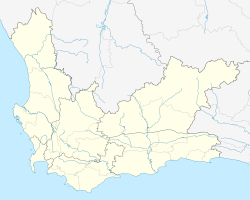 Bishopscourt is a small, wealthy, residential suburb in the Southern Suburbs of Cape Town in the Western Cape, South Africa. It is part of the Cape Town Metropolitan Municipality, created in 2000, which includes the greater Cape Town area. It has approximately 350 houses most of which are on more than 4,000 square metres (1 acre) of land. 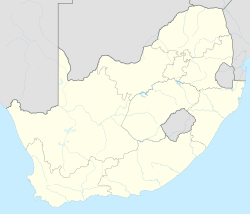 The suburb includes the official residence of the Archbishop of Cape Town, which is known as Bishopscourt, whence comes the name of the suburb. In 2015, it was ranked the sixth richest suburb in South Africa with an average property value of R11 million. ^ a b c d "Sub Place Bishopscourt". Census 2011. ^ "Bishopscourt residence of Anglican archbishop, Cape Town". UCT Libraries Digital Collections. n.d. Retrieved 2018-04-20. ^ "Bishopscourt". Bishopscourt Residents' Association. n.d. Retrieved 2018-04-20. ^ "South Africa's top 10 richest suburbs". businesstech.co.za. 17 November 2015. Retrieved 2018-04-20. This page was last edited on 22 March 2019, at 21:09 (UTC).